We got the call from our builder to head to their new house asap. It was about 8 am and there was a “walk through” with the homeowner at 9 am. When I walked into the basement entrance there was water dripping from the ceiling and the builder’s sales rep was there with the construction foreman. They directed me up to the second floor where the leak occurred. We headed up the stairs passing the 1st floor where the living room ceiling was dripping with water. It was the longest flight of stairs I had ever traversed. It seemed to take a week to get to the top. There was a small pond on the 2nd floor. In the hall bathroom behind the toilet was an open ended stubout where angle stop used to be. The compression angle stop was dangling from the toilet by the supply tubing. If you ever wondered how long it takes for a 1/2 inch pipe to fill a house with water I can tell you. About 2 minutes. We had made it clear to the foreman that our policy is to turn the water to the house off at the end of each day in case there was a leak somewhere. We would rather find a leak during the day than discover a flood in the morning. On the day of this flood they had arrived and turned the water on only to realize the leak when the water started dripping from the ceiling. The angle stop had pushed itself off of the copper stubout due to the compression ring not compressing around the pipe. 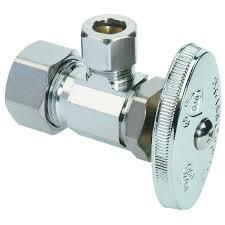 In recent years brass with lead in it has been removed from the market where potable water fittings are concerned. As a result the lead free brass is noticeably more rigid and less malleable. It takes more torque to force the brass ferrule into a compressed state forming a water tight seal around the pipe. The installer in this case thought he had a good watertight seal after turning the compression nut on the angle stop to the torque he was accustomed to. The same torque would have worked fine with the old leaded brass ferrules but not with the lead free brass. Brasscraft angle stops come with instructions to turn the compression nut hand tight plus 3/4 of a turn. With the new lead free brass this can feel like quite a bit of torque. You will likely need very large wrenches to achieve the required torque to get 3/4 of a turn. It is my hope that this article will save someone else the anguish of a flood caused by this phenomenon.